Ansar Ahmad Shaikh, son of an autorickshaw driver, cleared the Union Public Service Commission (UPSC) examination in his first attempt. 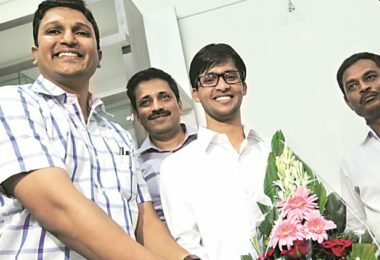 The 21-year-old went on to become the youngest candidate to have cracked the civil services exams. In the UPSC results that were declared on Tuesday, Ansar ranked 361. He is from the Other Backward Class (OBC) category, and is certain of getting into the Indian Administrative Service (IAS). Ansar, who will celebrate his 22nd birthday on June 1, hails from Shelgaon village, Jalna district in the drought-hit Marathwada region. His father Ahmad is an autorickshaw driver. Ansar explained that his father is an alcoholic and often physically abuses his mother. Despite adverse circumstances, Ansar focused on his studies – went to Shelgaon Zilla Parishad School and secured 76 per cent in 10th standard, opted for arts in junior college and cleared 12thstandard with 91 per cent. He then came to Pune for further studies. Ansar took admission in Fergusson College for his BA. Simultaneously he started studying for the UPSC exams. Ansar put in 13 hours of study every day for UPSC. He passed BA with political science as special subject, with 73 per cent in 2015. In the same year he appeared for UPSC exams and opted for political science. As for his future plans, Ansar wants to focus on some key areas once he joins the services. “I want to work for religious harmony, women’s empowerment and rural development. As an administrator, I will be able to work on these issues. I want to work for Hindu-Muslim harmony as I have seen religious tension in my village. My sisters were married off at the ages of 14 and 15. My father beats my mother. Therefore I have decided to work for women’s empowerment. Farmers’ suicides are a serious and administrators can do a lot to solve this issue. I want to serve the people of my country honestly. It takes patience to clear competitive examinations,” concluded Ansar.